You’ll need your cleaners and tools. OK, declutter first. All the entries, and the coat closet. Box up the coats and hats and scarves no one wears. You probably store seasonal things here, but make sure there’s room for the things that actually belong in the coat closet (what was the purpose of it? Remember?) If you want to add some spice to your closet, Tsh suggests painting the inside a fun color, maybe even taking the door off and making this into more of a nook. Clean the front entry- wipe all the dust, get all the cobwebs, clean the finger prints off the door and door frame. Now, organize the front entry. If your coat closet doesn’t meet the need of “entry way dumping ground” for keys, purse, wallet, receipts, dog leash, etc. consider getting a small piece of furniture that will meet the need so your things have a home that makes sense. I know our entry needs some work in this area- right now my purse ends up at the first place I sit down when I get home, keys go in a bowl at the top of the stairs, receipts go in a basket next to my computer, and my cell phone I NEVER know where it is. Drives my Dad (who has been in telecom since it STARTED) absolutely bonkers. Keep it all in the coat closet- add storage shelves with labeled baskets for everyone in the family, receipts, winter gear, outdoor toys, etc. Keep it organized and in the open- Build a vertical system by the front door, with a small footprint. A little dresser, a book case with baskets, etc. If you have an electrical outlet, keep your devices here when they charge- you can drill a hole in the back of your furniture to thread cords through so everything can charge out of sight. A note about shoes: Tsh reminds us that in most cultures, they walk a lot. Their shoes are dirty! We don’t walk so much, so our shoes aren’t so dirty, and taking them off isn’t part of our culture when we enter a house. If you DO wants guests to take them off, provide a shoe rack for guests to use, and an assortment of slippers. Clear out any dead plants on the porch, sweep, get rid of cobwebs. Clean the welcome mat with some sudsy water and a scrub brush- if that doesn’t brighten it up, add “welcome mat” to your shopping list. They’re not expensive. Clean the door, the windows, the steps. Clean clean! Step back and see how it looks. Cozy? Inviting? Would adding a potted plant help? Decide what it needs. This spot gets neglected! Clear away the clutter, and clean it up. Organize things- BBQ tools, gardening supplies, outdoor toys. See if you have space to put out a little outdoor dining area. I definitely want one of these- we have a nice, shady backyard for picnics in the summer, but no picnic table. We sometimes carry the folding table out to the deck, but that’s a lot of bustle and hustle when I’m trying to finish up cooking dinner! We installed a big patio in the front last year, too- I want to find a little bistro table for there as well. Now. You. Are. Finished. Do you feel good? Go do something fun! This hoop house is flexible, easy to set up, easy to take down, easy to store, and cheap. Yes please! I got the idea from The Urban Gardening Handbook. I mean, binder clips? Awesome! 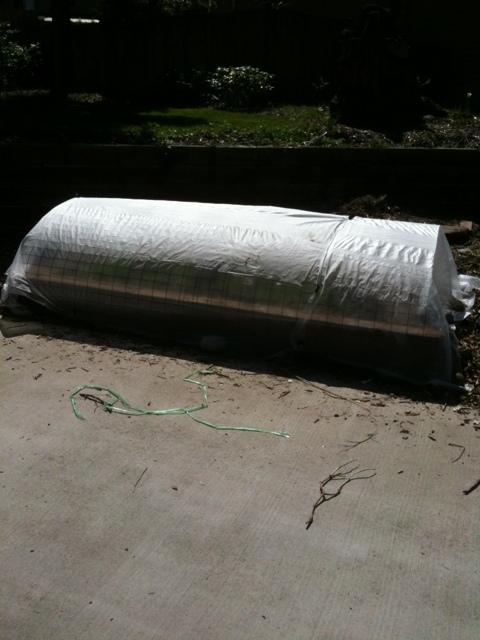 I found a huge roll of coated wire fencing in our shed, left behind from previous owners. So, that was free. The plastic sheeting over it is Reemay, a brand of floating row cover. Sun and rain can get through, but birds and bugs can’t. Also, torrential spring rains won’t wash away your seeds with this covering them! It also creates a slight greenhouse effect, which definitely helped with germination in cool Spring months! If you don’t want to buy a roll of wire fencing, you can sink short lengths of PVC pipe around the perimeter of your bed, and arch ling pieces of narrower PVC conduit pipe over the bed with either end in one of your anchor pipes. Before I got the hoops built, I had the Reemay directly on the bed, weighted down with rocks. It’s really light- the pea sprouts underneath grew to be about 3 inches tall, and had no trouble lifting the Reemay as they grew! To make the hoop house, I cut two six foot sections of the wire fencing, and arched them over my bed. The bed is 8 feet long, and about 2 1/2 feet wide, from outside edge to outside edge. The Reemay is about six feet wide (be sure and unfold it, there are lots of pleats to make it about 3 feet wide on the roll!). 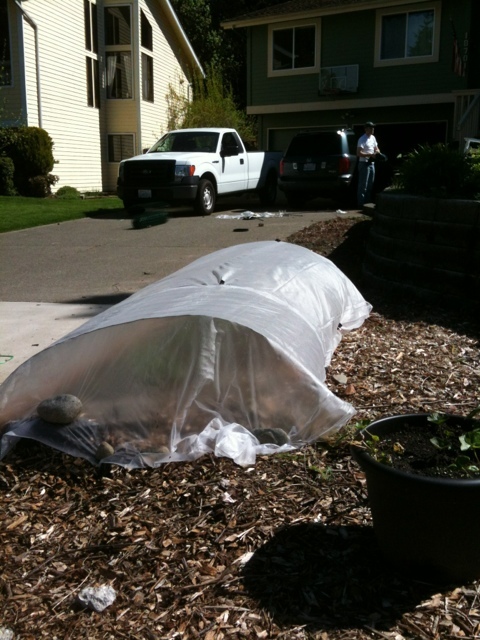 I cut it long enough to go the length of the bed, from ground level, over the hoop house. Then, a few well- placed medium binder clips to hold it against wind, and we’re in business! I am hoping this set up keeps out the bunnies- we don’t have a lot, and they’re not terribly hungry or adventurous- our yard backs up to a greenbelt, and normally the bunnies contain themselves to our back lawn, or mustard garlic if it’s available. I actually considered leaving a patch of that invasive weed off to the side to see if it made an effective trap crop! Tomatoes, tomatillos, and basil are on their way! I planted these seed flats back in February, and they’re getting to the transplant stage now- I wait for them to either be about an inch high, or have at least buds of their first true leaves. When a seed sprouts, the leaves that emerge look nothing like the leaves of a mature plant! In past years, I’ve waited too long to transplant them to cups, waiting for fully formed true leaves. I wasted so much growing time…live and learn though! 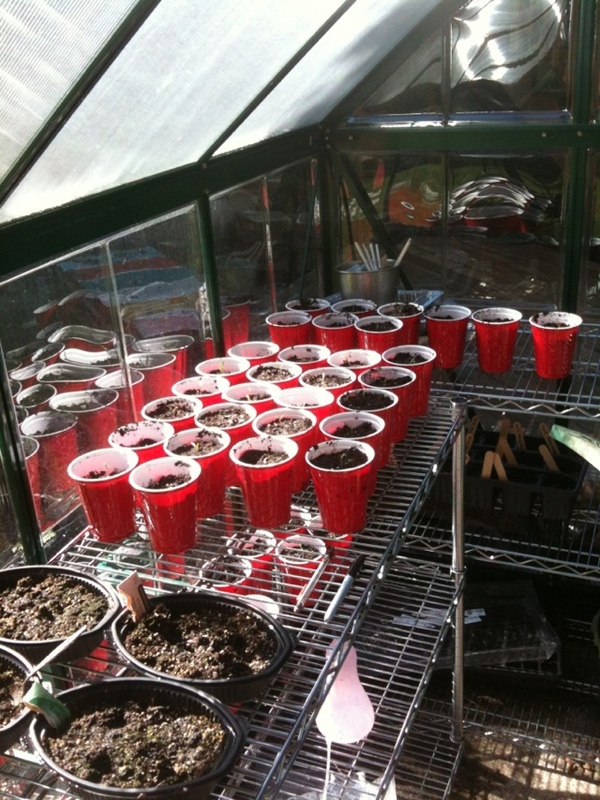 My takeaway lesson this year will be to sprout the seeds indoors, where it’s warm, and then move them outside to grow. I think it will get me to this transplant stage a few weeks earlier. Tomatoes won’t go in the ground until probably late June- night time temperatures need to be above 55. Sometime in September or October rain and cooler days will come- it’s a balancing act trying to leave fruit to ripen, but to pull it before the plant starts to rot and shut down. So, these plants will have about 12 weeks in the sun. Our master bedroom should be a sanctuary. Yes, in an ideal world- the author is quick to note that a single-purpose room in our home is a luxury most don’t have! If you must have a desk there, keep it small and neat. If you excercise there, make sure the equipment can be stored away when not in use. As you tackle the master bedroom, make sure your spouse (if applicable) is involved, and has a say! Try to get a sitter for the kids, so you two can focus. You’ll need cleaners and tools. First, figure out the purpose of this room. A retreat, an office, a library, a workout space? Whatever you decide, try to keep stressful activities out- pay bills somewhere else, fold laundry somewhere else! OK, now let’s declutter the closet. Pull out the clothes, and box up what you haven’t worn in a year. What’s left should be your regular clothes, plus a few key pieces for special occasions. Do the same thing with jewelry, bags, and shoes. 3. My note up there goes right into item 3: know what colors and cuts look good on you. Tsh recommends Color Me Beautiful, and I do too! Some advice is a bit dated, but it’s still spot on in so many of the right places: you’ll figure out your seasonal color palette, and decide what your core style is. I’m a winter who wears classic styles- you generally won’t find earth tones or pouffy sleeves in my closet! Jewel tones, strong neutrals (black and white), and a select few pastel/icy colors. Everybody looks good in raspberry, though. And possibly peacock blue. Alright. Closets are empty, now clean them. Organize the closet- let a small space dictate how big your wardrobe is, you can’t fit 3 feet of shirts in 18 inches! Decide how big your wardrobe is going to be, and if something new comes in, something old needs to go. Now, declutter the room- take care of the night stands, and under the bed. Clean the rest of the room, and organize. If you keep things under your bed, and if they’ve survived this process, they must be important. Keep them in plastic under-bed-storage boxes, to protect from dust. Reflection time! Stand back: does the room reflect BOTH of you? Are you happy with it? Make sure it meets, in part at least, both visions of what the room can be. I have to be honest, the master bedroom took most of a week to clean out. My first week of cleaning, that’s all I did! I didn’t work in the yard, teach piano, or even cook much. This week, spring break is over for my piano students, I’m catching up on my weeding, and the family DOES need to eat better than we did last week. We also keep a lot of stuff in the master bedroom- out of season breakable decorations, some fancy dishes, wrapping supplies, biking gear for my husband, my kids’ books that aren’t currently on their shelves, spare curtains, emergency kits and lights, along with clothes and such. But, a large garbage sack each of trash and to-sell items left this week, and a lot of the things that didn’t have a spot fit on the shelves quite nicely. So, major improvement! Are you ready for this? Two days. Lots to do. With your kids. And a smile. Tsh suggests turning on some music to keep it light hearted. Figure out the purpose of your kids’ rooms, and keep this firmly in mind when you start. Consider if kids have good relationships with each other, or if the home is adversely affecting their relationships. Does one child need their own space? Are they squabbling over toys stored in a certain child’s room, that should be accessible to everyone? Think about people more than things, and make your home work for your children- move things, give the kids the space they need to grow. Maybe combine two kids into one room, and use the other for toys. That kind of thing. Figure out what each room needs to be. Declutter: take everything out, box up what’s too small. If you’re saving it for a younger sibling, store it away in a plastic box. In what remains, sort out the off-season clothes and keep them somewhere close, perhaps the top of their closet? Match up the socks, and make a list of what you have for each child. Don’t take the kids. Amen. Go with cash- a cheap shirt you don’t need is a bad idea. Cash helps you keep a level head. Clean the closets while they’re empty, and organize. Put clothes away were kids can reach and put them away by themselves- lower the closet bar, keep a stool there, etc. Declutter the books. Charlotte Mason coined a word: twaddle. “Dumbed down literature, absent of meaning.” Get rid of twaddle. Clean the bookshelves, now that they’re empty. Clean the floors, windows, blinds, door, door knobs, ceiling fan, etc. Reflection time! Are these rooms a stimulating haven for learning and growing? Do they reflect your children? Ask your kids what their dream room would look like, and consider implementing one thing from their list in the next few months. Today we clean the bathrooms and linen closet! You’ll need cleaners and tools. Quick question: What is the purpose of the bathroom? Besides the obvious, of course. What ambience do you want in there- playful, for kids? Perhaps spa-like? That’s part of its purpose. Step one: declutter. Remove EVERYTHING. You’re getting to be a pro at this. Step two: sort. We’re going to go through the cosmetics and toiletries, and then your linens. Look at the cosmetics and toiletries- throw out anything past pull date, consolidate the useful (shampoo can totally be mixed together! ), throw out what’s open but not being used, give away what’s un opened and not being used. A little discussion about cosmetics. First off, Tsh gives us a handy reference for how long you should keep makeup after opening it. Now, the second thing to think about with cosmetics: do you really want them on your face? All those chemicals? Heavy metals? Is it time for a “green revolution”? Linen Closet! Take everything out, take a look. Check out your towels- are they too old? Are there too many? How about sheets- do they fit any beds currently in your house? Are they dingy? Make an inventory of what you have. Step three: Clean. Clean everything, top to bottom, inside and out. Take a look at your bathrooms. Do they live up to the ambiance you want for them? What needs to change? This was a blessedly easy day for me. Nothing very difficult about emptying a linen closet, deciding that one bed doesn’t need four pairs of cotton sheets, and putting my favorites back in the closet. I was amazed at how much space there was after I reorganized, though! No more danger of quilts falling on my head every time I open the door. There wasn’t much in the bathrooms- a few old bottles of lotion and sunscreen hit the trash can, and some old toilet brushes. I tip toed past the master closet to clean the master bathroom (it’s connected) and told myself that obviously the closet would get taken care of when I took care of the master bedroom. That closet is SCARY. It’s where toys get indefinite timeouts, emergency lanterns and packs are stored, and a hundred other random things that belong to my husband and I and have no other home. (Things like wrapping paper, spare curtains and rods, the fancy dishes, presents for other people, bike panniers and gear, jewelry, a tent that fits over a twin bed…oh, LOTS of things!) This was definitely a nice change of pace from the mayhem of taking my kitchen apart. My kitchen is lovely now, but it was a bit hairy during the cleaning process! I’m filling up a spare room in the basement with everything we plan on getting rid of at our garage sale. I have the most amazing idea: Everything for a Buck. (Unless it’s something big, like the hubby’s bike wheels.) It’s good, right? It totally work at Target, in their dollar aisle. Even though we’ll be part of a neighborhood-wide garage sale, I’m sure people will FLOCK to my driveway, to buy all this stuff, so I don’t have to haul it to the DI. Or dump. The rooms that are done feel good. Really good. I know what’s in every drawer and on every shelf. It’s all clean and organized. All the junk is edited out, so it doesn’t feel so crowded. We’re spending more time together in those rooms, just sitting. My oldest daughter took her current embroidery project into the living room today, and worked on the couch. The love seat/couch that’s no longer buried under 6 throw pillows. There are some things that are hard to edit, though. Craft supplies are my bugaboo- I have a shelf in the school room packed with random stuff- old silk flowers, a fake pearl garland, big mailing tubes, rubber stamps, poster board, upholstery tacks, glittery puffy paint, etc. It’s just all so COOL, and what if we want to make something out of it someday? Never mine I’ve had a lot of it for over 5 years. Or 15. I’ve decided that having that space filled with “maybe someday” stuff is OK.
I’m excited to move forward through the rest of the house, but I really AM tired. I think in the end it will be worth it- I’ll certainly be more careful about sticking stuff on shelves to be dealt with later! After the kitchen is done, it will be time to get at the bathrooms and linen closet. That won’t be too bad, especially since the cleaning part is under control. (Thank you, Margarita and Salvador. Hiring you is one of the nicest things I’ve ever done for myself!) Then it’s the kids’ stuff, the master bedroom, and the entries/coat closet. The kids’ rooms were pretty thoroughly gone through a few weeks ago- I’ll do it again, there’s more that needs to go, but I know I’ll appreciate the week I spent already. The master bedroom is going to be killer. The entries and coat closet won’t be so bad, I think. But oh, the master bedroom. So much stuff gets hidden in there, stashed away from the kids, or just stuck on a shelf when guests come. This is going to be SO WORTH IT WHEN IT’S DONE!